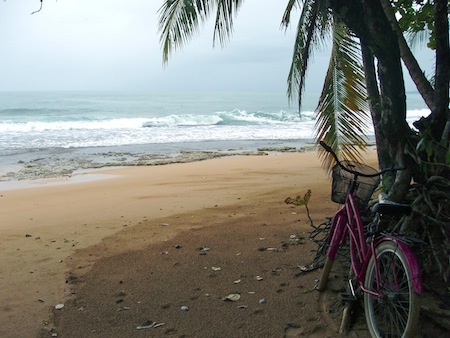 The past few days we’ve been viewing properties here on Isla Colon and around on the other islands. We had a few specific things we were looking for; easy access to a beach or oceanfront, a view, a certain amount of space between us and the neighbors, if possible, a place to put Escapade. Our search really began as a lot of “what if” conversations we’ve been having as we ride our bikes past “Se Vende” signs, and imagine what it would be like to live here. Coming here was partially to research possible retirement spots in Panama, so we’ve been living a somewhat “normal” life; cooking, cleaning, exploring, socializing with all our new expat friends. It’s certainly fed the fever in us to get on to the next stage of retirement once the Inn sells! Unfortunately our hands are tied until then even though I think we could both just stay here forever. The house we’re renting is for sale, for $299K. It could be really nice with some TLC, but it’s next to a nasty neighbor on one side, and a little too close to the road for us. There are also some build-able lots in this “Big Creek” community, one of which is on the town reservoir where our friendly crocodile lives. Not a great swimming spot! There is a really nice spot that is right next to our favorite watering hole out by Playa Paunch. It’s two lots for sale, one on the beach level, and one right above it. The lower portion has an unfinished building on it that would be a perfect spot for a surfer’s hostel. The upper portion has an awesome view and is really nice. I think the price for the lower was $90K, and the upper for $160K; kind of a strange split. Our favorite spot of all are two adjacent hilly lots out near Bluff Beach that are selling for $89K. We would have access to a great little beach, and the beach side of the road can’t be built on because the government owns all beach access. If we built on one of the lots we’d be up high looking out at the Caribbean over the trees. It’s completely off the grid, but that really isn’t a big issue around here. No spot for Escapade out front either. 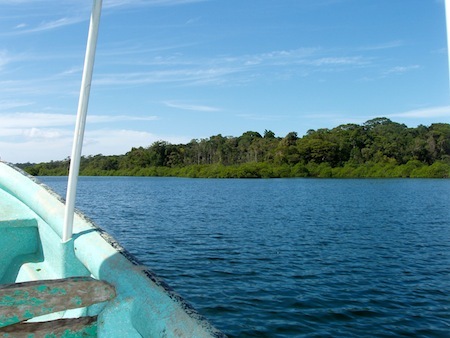 we set off on day two to boat over to Isla Caranero, the island closest to Bocas Town. We were heading to the opposite end and a long, narrow, pie shaped lot in a “planned” community. The only planning as it turns out is that there are paths created for access to the 20 or so lots created and a dock that has a slip available for each lot owner. It did open up on a Caribbean facing beach and included a very nice building site that would afford an awesome view with nice breezes. The rest of the lot was narrow, rolling hills that did not have a view. What the heck would I do with the rest of this land when all my time would be spent sitting on the deck, drinking rum and watching the Caribbean? 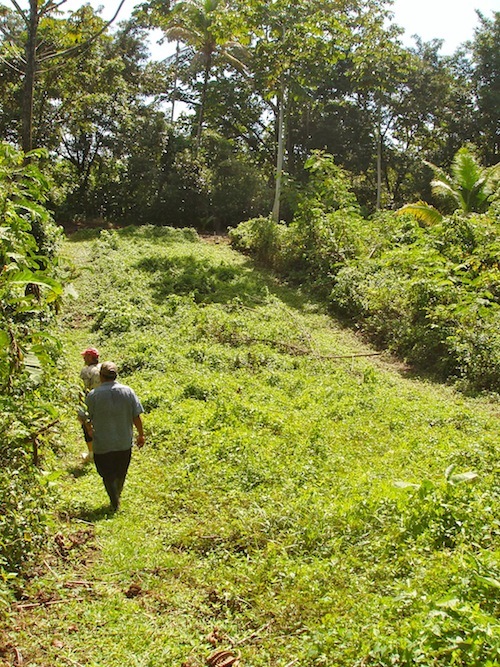 At $190K, it is rather expensive land to not use. This is the little beach on Isla Caranero; narrow lot but great view! We then returned to our water taxi and took off around the other end of Isla Caranero out past a gorgeous house on Hospital Point on Isla Solarte to look at a 4 acre “L” shaped lot for $125K. Isla Solarte is pretty steep so houses are up high. 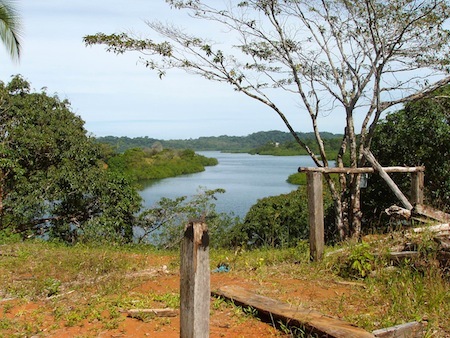 The waterfront is covered in mangroves; locally referred to as “Los Viveros,” (The Nursery), because of all the fish that grow up using the mangroves for protection. We climbed the hill to check out the view and again were rewarded with a fine view of the mangroves, little bays, and Isla Bastiementos. It was very quiet and did not have the breeze we felt at the previous site. We quickly discarded this from our list, mostly due to the lay of the land and the view not being as nice as previous spots we’d seen. Our taxi ride through the mangrove island maze! Back to the taxi, where Juan patiently sat waiting for us and on to visit Russell the Builder. His location was on the same island but we had to wind our way through a maze of mangrove islands to find him. Russell is a leftover 60’s hippie, with a twinkle in his eye and stories to tell! He showed us 2 houses that he was constructing using a wood called Nispero, or Bulletwood. It is a very dense, hard wood that sinks in water. Russell has married into a woodcutter family and so gets the choicest tropical woods set aside for him. Beautiful grains, no knots, and ends up being a lighter color than most of the woods used around here. The great thing about using this wood is it cuts the price of construction per square foot from $115 down to $65. Bruce the Solar Dude wasn’t there at the time but he is the “go to” guy for the solar setups. Departing Isla Solarte we then went over to Dolphin Bay on Isla Cristobal. 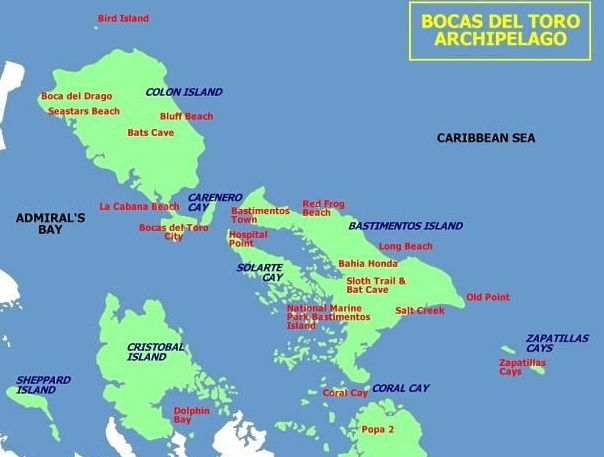 This area of the Bocas Archipelago is full of mangrove islands, and it’s really beautiful, but doesn’t invoke the typical Caribbean scene of white sand beaches and waves rolling in. It is however the perfect spot to put down an anchor and wait out hurricane season on Escapade! We saw a property here that has it’s own dock with palapa hut (the dock is in about 4 feet of water), and a long walkway through some beautiful landscaping to a small house that needs major TLC. There are two floors though, and the view from upstairs is wonderful, looking out across Dolphin Bay toward Bastiementos. For $175K and an acre of waterfront property it was very inviting, until we took the water taxi back to Bocas. Twenty minutes of teeth-jarring bouncing in a water taxi with wood seats kind of brought us back to reality! And that’s when Reality jumped up and slapped us good! We have looked at some beautiful spots here and being here for a month has given us a strong desire to live here. 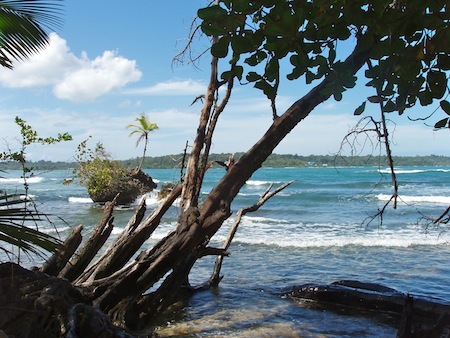 Unfortunately, costs have increased quite a bit since I started looking at Bocas as a retirement spot 4 or 5 years ago during my BS period (that stands for Before Sue). 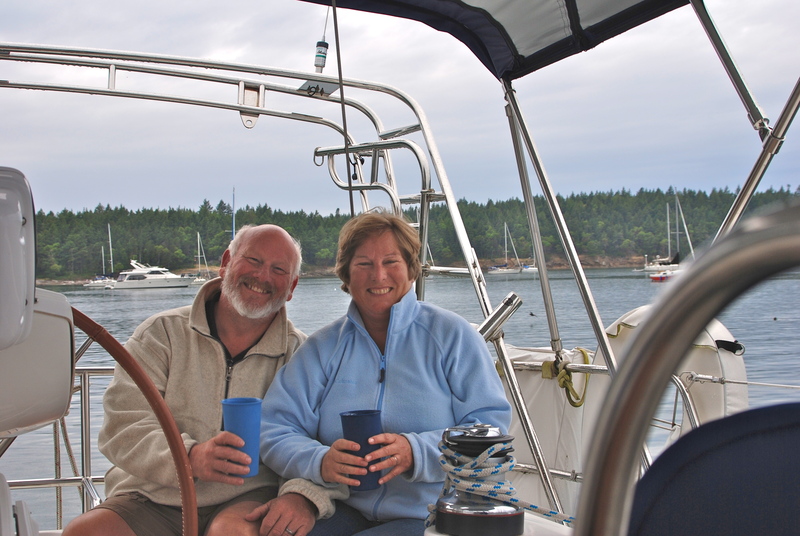 The real wake up call that we had, though, was to refocus on our first dream of sailing; visiting new and exciting ports of call, and living the life of a coastal Cruiser. In 20 or 30 years when we can’t raise a sail anymore, we’ll start working on Plan B and figure out how to put a roof over our heads! So for now, we will “Remember the Dream” and focus our efforts and our pocketbooks toward escaping on Escapade and Live, Love, and Laugh our way back to this little slice of paradise! Escapade waiting for our return! This entry was posted in Life Events, Panama, Random Thoughts. Bookmark the permalink. Sounds like you’ve just had an intense Isla Colon-oscopy. Without it, you’d have never known…now you can focus on more actively enjoying what’s over every next horizon…. 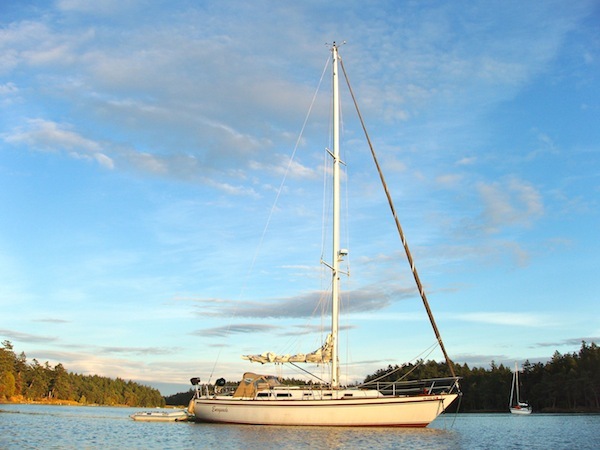 worrying about sails and not anchors…all on an Escapade. Looking forward to trying to grab more out of you about you time there when you get back….whenever that is…! ?